On Wednesday, The Hill reported: “Mulvaney walks back Trump’s comments on wiping out Puerto Rico debt. 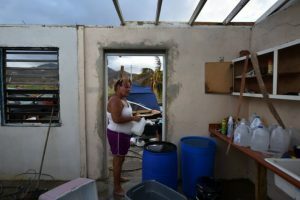 “The hurricanes have hit at a time when Puerto Rico is facing an unprecedented economic crisis, having already suffered a lost decade without economic growth. Unemployment is at 11.7 percent, more than two-and-a-half times the level of the United States. The poverty rate is at 46 percent, and 58 percent for children — nearly three times the U.S. rate. In the past decade, about 10 percent of the population has left the island, and the pace of out-migration has doubled in recent years. “Unfortunately, over the last year or so, the U.S. federal government has made this economic crisis much worse. The Obama administration — with input from Republican congressional leaders — appointed a fiscal oversight board that imposed a draconian austerity plan on Puerto Rico in response to the island’s default on its $74 billion dollar debt. The plan [PDF] proposed by this board was rejected by creditors who — amazingly — wanted to squeeze even more out of Puerto Rico. But regardless, the austerity condemns the island to a second lost decade and more.